Honestly, we weren’t very sure about this one. We love Sonam Kapoor and the way she looks, but when it comes to acting and dialogue delivery, that girl really needs to work on it and then there is the producer Arbaaz Khan, who doesn’t really interest us too much. But man we were wrong and we are glad we were. 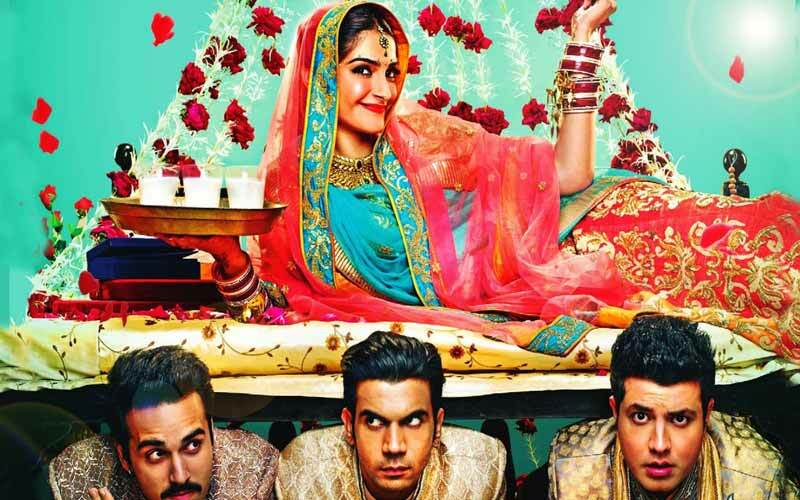 Dolly ki Doli is that kind of film that you would want to watch on a lousy day to life up your spirits and make you smile from ear to ear. The story is quite simple to begin with. Dolly (Sonam Kapoor) is a con bride who marries young, eligible men, gives them a wonky ‘doodh’ on sughaagraat that puts them off to sleep. The next morning, well, Dolly is off to some other place with all the money gone. Obviously she cannot pull off a con like this alone and therefore has a dad, a ma and a brother (Mohammad Zeeshan Ayub) to back her up. Now one of the heart broken grooms Sonu Shekhwat (Rajkumar Rao), a sugarcane farmer in Haryana, decides to avenge her. He had married her against the will of his family and cannot stand the humiliations she projected him to. He decided to involve the police in this entire drama, enter Pulkit Samrat as inspector Robin Singh. Now, besides Sonu’s experience, Pulkit too has reasons to avenge Dolly, which we are shown later on. Varun Sharma, as the typical, average Delhi guy and one of Dolly’s grooms is fantastic. His love and fascination for Dolly in spite of everything that she did to him, creates genuine moments for laughter. And then there is the very talented Archana Puran Singh, who plays his ever-so-dominating mother, adds to the humour in the film and takes it notches higher. Mohammad Zeeshan Khan is really likeable. Although he plays Dolly’s fake brother, he secretly is in love with her and doesn’t really let her know about it. The track could have got interesting had the writer explored it a little. Sonam Kapoor still needs to work on her accent. Rajkumar Rao is by all means the hero of the film. it is one thing to play a character and a completely different thing to become one. From the way he talks, to the way he looks, stands, walks, just speaks oodles about how talented and sincere this man is. Pulkit Samrat doesn’t impress at all and looks too stiff and expressionless in most frames. His track with Sonam Kapoor is also quite boring. Towards the second half of the film, it is revealed why Dolly cons so many men and the reasoning is quite a letdown. It doesn’t sound very believable or strong. One more thing that we couldn’t buy was how none of the grooms and their families could produce a single picture of Dolly in this world of selfies and cameras. But do wait for the end, it’s quite a surprise and breaks a lot of clichés. The film is a treat to watch just because of the way it has been narrated, treated and executed by all the actors.